A popular theatre venue in the centre of historic Cambridge, the Arts Centre opened its doors in 1936. It presents a wide variety of live performances ranging from plays, drama, pantomime, opera, and dance. 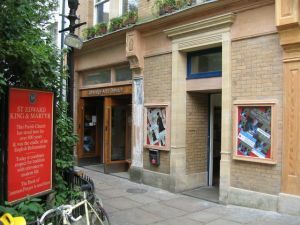 The Arts Centre often hosts shows immediately before or after their seasons in London's West End. There are several long-standing traditions associated with the Arts Centre; every three years it holds the University's Cambridge Greek Play, with performances entirely in the original Ancient Greek language. The Centre regularly offer performances by the University'a Marlowe Society Gilbert and Sullivan Society, and Musical Theatre society, in addition to appearances by touring companies. The Theatre opened in 1936 with a highly publicised gala featuring many of the foremost names in the art field at that time, including Dame Margot Fonteyn. The Theatre was launched by the economist John Maynard Keynes, who intended to raise the funds by public subscription, but when fund-raising efforts fell well short, he underwrote the cost himself. Among world premieres held at the CAT were Harold Pinter's The Birthday Party in 1958, and the stage adaptation of Girl with a Pearl Earring in 2008. Some of the famous actors to appear in performances include Sir Ian McKellen, Derek Jacobi, and Susan Hampshire. The Centre offers a very eclectic mix of stage performances. As I wrote this, scheduled shows include the Pirates of Penzance, Little Shop of Horrors, and the BBC Big Band playing favourite cinema soundtracks. It is safe to say the Centre has something for everyone!